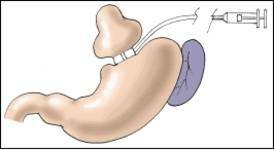 A silicon band with an adjustable diameter is placed at the entry of the stomach (the cardia) directly under the distal end of the oesophagus. It creates a little pouch in which food is held up and passed slowly, as if going through an hourglass. The patient can only eat small portions at each meal. The system is controlled by the injection of a liquid in a little reservoir placed just under the skin that is connected to the inflatable chamber of the band. The system is also called Laparoscopic Adjustable Band. Feeding habits are changed by a simple mechanical reduction. The system is purely RESTRICTIVE. It is not suitable for sweet eaters, neither for grazing eaters. It can be placed in patients with a BMI lower than 50 and who do not suffer from hiatal hernia or reflux.